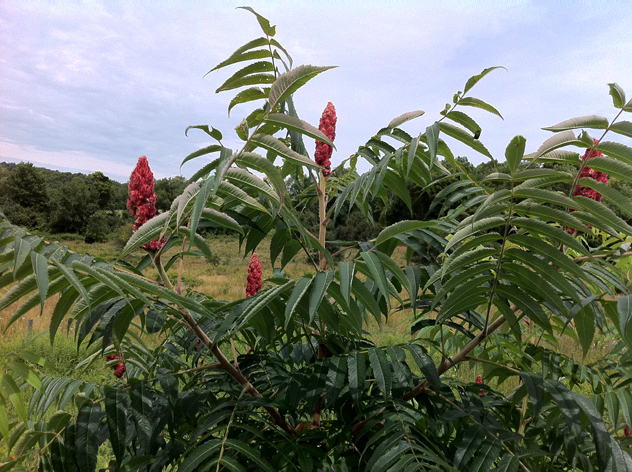 The common Staghorn Sumac- Rhus Typhina is native to the Northeastern US. I love this plant with its long flat leaves and the red fruit it produces in late summer. The fruit called “drupes” arrives at the terminal end of the branches in late July and holds its color into the winter. Because the plant spreads by rhizomes, it can be invasive and I would suggest if you decide to plant it, plant in the wilder parts of your garden. Mine just showed up probably with the help from some birds, in a location, I am not too happy about. Although it is still a small shrub, it can reach a height of 15 feet and a width of 30 feet or more. I cherish my view so this is the wrong plant for this site and has to be moved to another area. 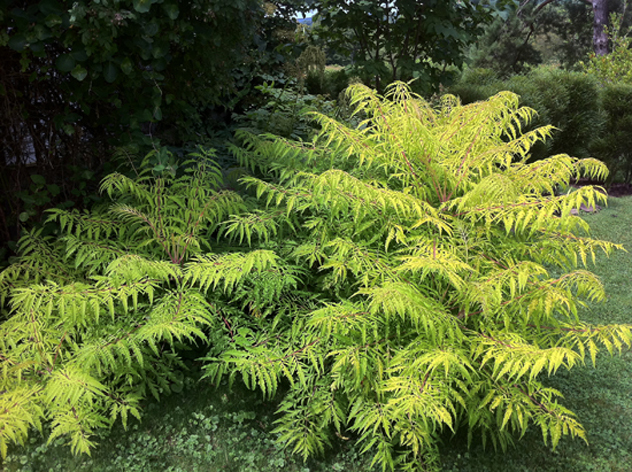 A few years ago, a hybrid called Rhus Thphina ‘Tiger Eyes’ was introduced. This sumac is a ‘dwarf species’ and reached a height of about 4’ feet in my garden. However, further south, they can easily reach a height of about 6’ feet. It also suckers and after about 4-5 years you may have more than on plant. I have three. I planted mine in a location that only receives morning light, and because of its shady location, the yellow leaves look good throughout the whole summer. I have seen this plant in full sun and it can look quite shabby by late summer. When the deeply dissected pinnate compound leaves emerge in the spring (1’-2’feet) they are a beautiful chartreuse color and by high summer have turned a brilliant yellow color. 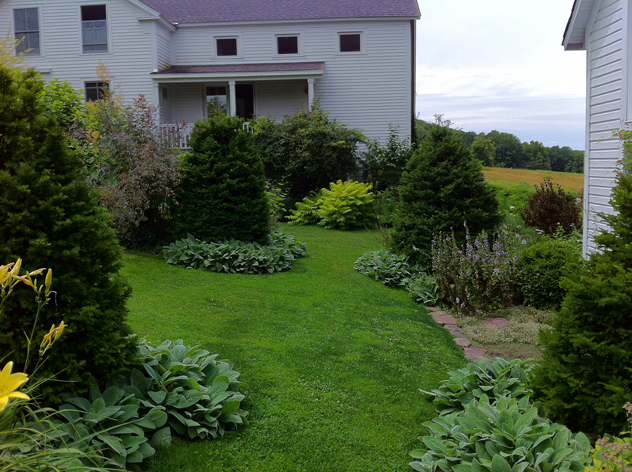 This disease resistant shrub makes a wonderful accent plant in the garden. The fruit turns a beautiful red and the stems of this plant are also red. I planted mine at the end of an avenue and the glowing chartreuse leaves really catches your eye and lightens up the shady area. In the fall, the leaves turn a brilliant orange. Rhus typhina ‘Tiger eyes’ at the end of an avenue. 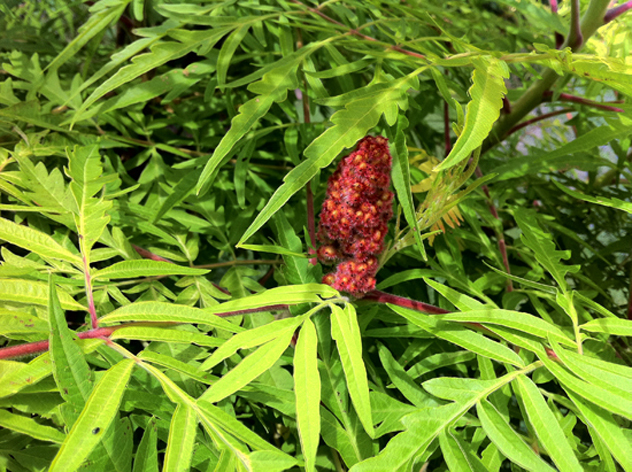 Gallery | This entry was posted in Shrubs and tagged Rhus typhina 'Tiger Eyes', Rhus Typhina- Staghorn Sumac. Bookmark the permalink. When the fruit appear on the shrub what should I do with it, just leave them on there or take off. Hi Laraine, I just leave the fruit. I like the color and texture. Hi Don, I am thinking of planting Tiger Eyes, is it as invasive as some people claim, hard to control? Are you suggesting that it is best planted avoiding the midday sun? I have had the plant for about 7 years and it is NOT invasive like the species. I have noticed when it has been planted in full sun the leaves get scorched. My plant just gets morning light and rest of the day there is indirect light and leaves stay fresh and beautiful all summer. The plant really glows and brightens up a dark corner of the garden!